Vowing to target the Islamic State with air strikes 'wherever they exist', Pres. Barack Obama pledged to lead a broad coalition to fight IS and work with 'partner forces' on the ground in Syria and Iraq. The State Department lists 60 allies who've joined the US-led coalition combating the Islamic State (IS, also known as ISIS or ISIL). Each nation has a different role: some are assisting by sending humanitarian aid, while others are sending fighter jets and ammunition. 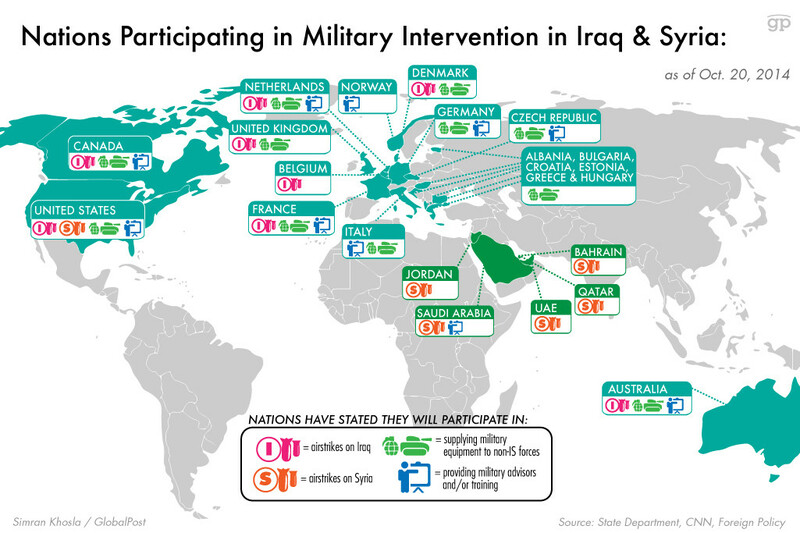 Currently, 23 nations are involved in the military intervention in Iraq and Syria targeting IS. The chart below lays out who's doing what among those countries — conducting airstrikes in Iraq or in Syria, supplying military equipment to non-IS forces, or providing military advisors and training to ground troops. The United States, joined by Middle Eastern coalition partners, is the only Western nation carrying out strikes in Syria. European nations assisting in the fight have said they will not bomb IS militants in Syria, which inadvertently benefits Syrian leader Bashar al-Assad. The military equipment and advisors these nations provide are intended exclusively for fighting IS in Iraq. Turkey, which views the Kurdish forces as a threat, has so far resisted supporting their ground invasion against IS, except to allow some peshmerga fighters through its territory into Syria.